As part of the ongoing work to integrate core University resources with Canvas, we’re really delighted that the Talis Aspire reading lists are now fully operational within the VLE. 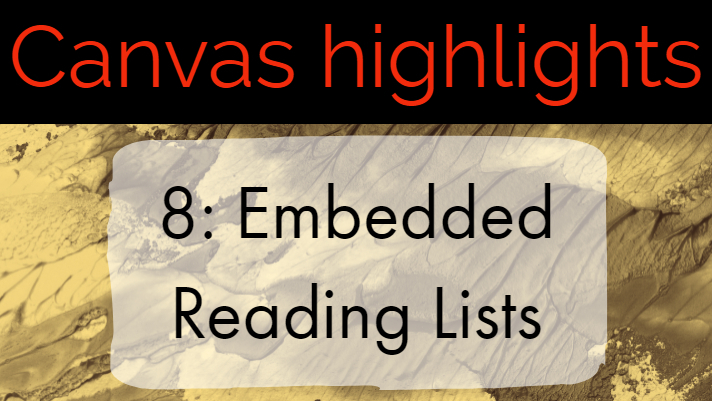 To mark this, our latest Canvas Highlights post, written for us by our colleague Rachel Bramley, Learning & Teaching Librarian here at Sussex, explains how to make use of the integration and embed reading lists within a Canvas module. Isn’t it great when students can easily find what they need? Students should be able to find their reading lists through the related Canvas sites. 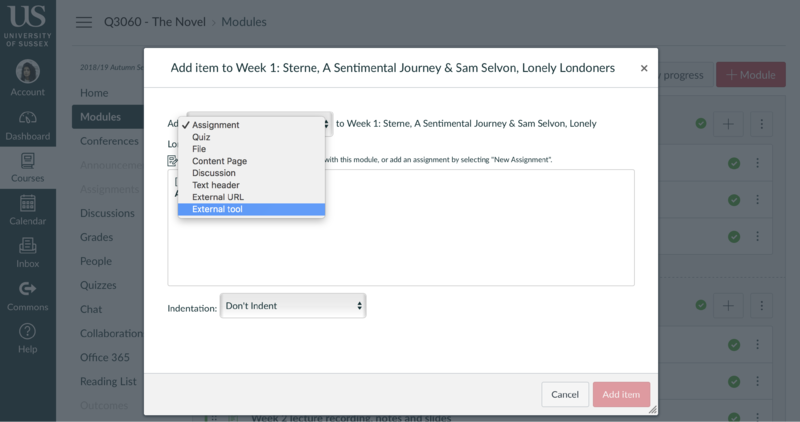 There is an option on your Canvas menu that automatically displays the whole online reading list. 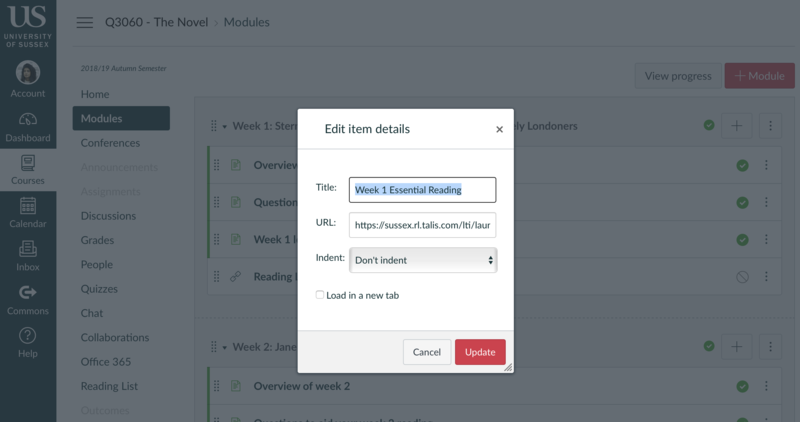 If you choose to, you can also embed each weeks’ readings into the relevant sections or ‘Units’ within your Canvas sites too. 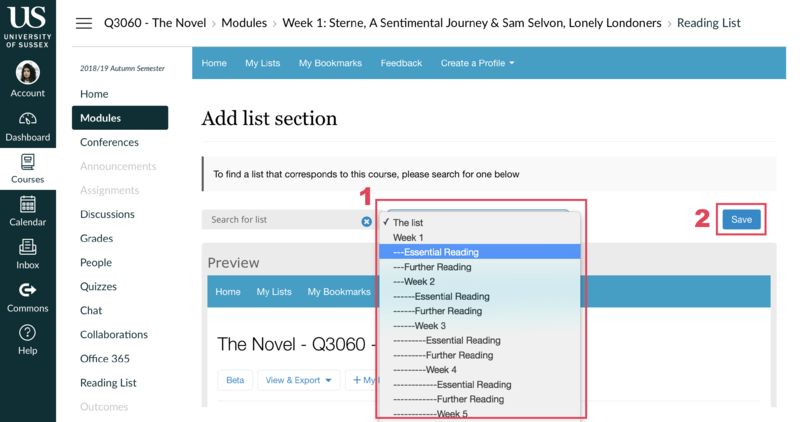 The reading list in Canvas will be ‘live’, so if you make any changes in the Talis Aspire Reading List site, they will instantly be visible on Canvas. 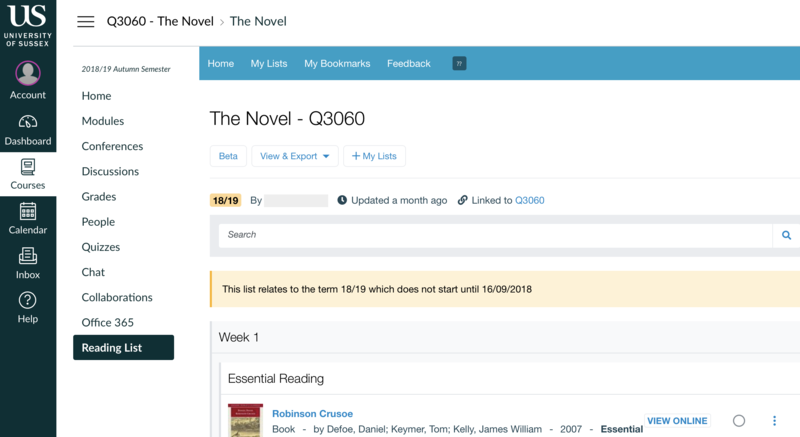 And because of the improved integration, students won’t be taken out of Canvas when they navigate to the reading list, it will open up within the same page. 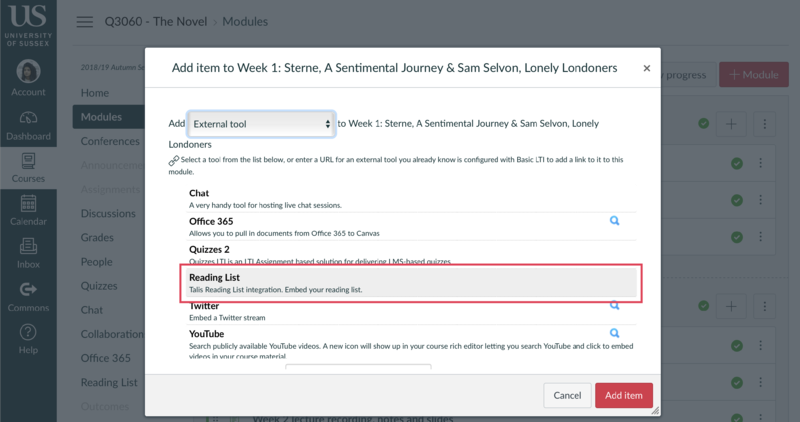 The option that automatically links to the relevant online reading list, appears in the Module menu under Reading List. It uses the unique module code to identify match the module to the correct list, although as a tutor you should visit the link to confirm this match before it gets set up for your students. The initial view of the reading list, showing (1) the Reading List menu item, (2) the name/code of the selected list, (3) the search box where you can look for a different list, (4) the Save button to confirm this list as the one to be used. Having clicked Reading List (1), you can check the module code/title is correct(2) (you may first need to confirm your login). If it’s not right, or you need to link to a different list, you can type in the required module code/title to search for and select it (3). You will also see, next to the list title, a box saying “The list”. This option will display the entire reading list, although you can choose to show less if you prefer (see below). Once you are happy the list is the correct one, click save to confirm it (4). This list will now always be displayed to you and your students when you click the Reading List menu link. If you’ve accidentally linked to the wrong list, as a tutor you can use the “relink” option to start this process over again. In the “Units” view of your Canvas site (which may also be the home page), go to the relevant unit, for example Week 1. Select ‘External Tool’ from the dropdown menu. Select ‘Reading List’ from the options and ‘Add Item’. 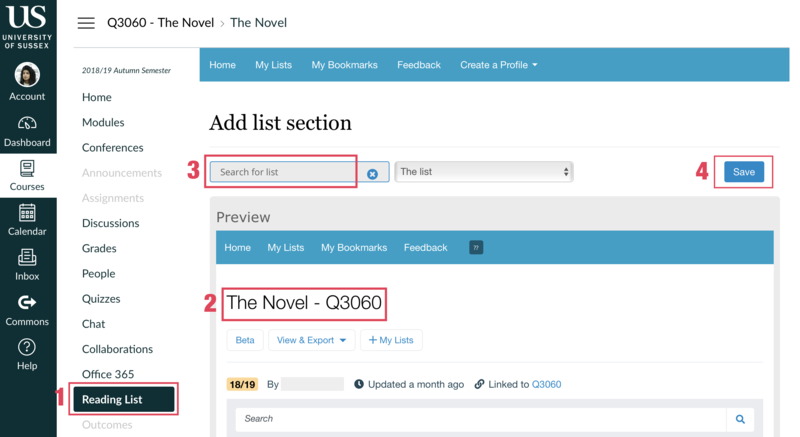 You now need to choose what section of the list should be displayed here: click on the link saying ‘Reading List’, in the item you just created. When back on the Units page, give the item a clear title, for example ‘Week 1 Readings’. To do this, click on the three-dots icon on the right hand end of the item row and select ‘Edit’. Type in your preferred title and click on ‘Update’ to save. Lastly, don’t forget to publish it! If you would like help getting started with online reading lists or if you want further help, please contact readinglists.lib@sussex.ac.uk or phone us on x7926. Our thanks to Rachel for this Highlights post. 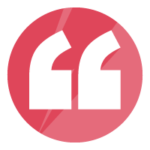 Whilst Talis Aspire is a core University resource and should be used for reading lists across all taught modules, we know that some Canvas sites will not have a Reading List associated with them. In these cases, you might wish to remove the Reading List menu item from view to avoid confusion. 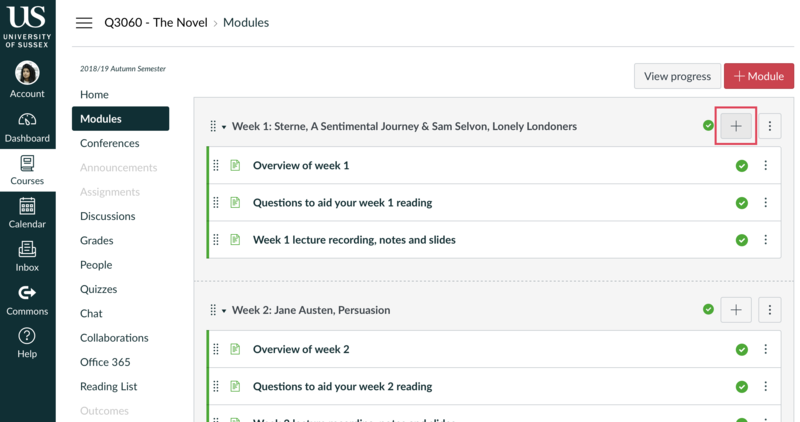 Please refer to our Canvas Know-how post on the Module Menu for advice on how to do this. Places are filling up fast on our Canvas Fundamentals training workshops. We strongly encourage all Sussex academic staff to sign up for a place. Attending the workshop will familiarise you with Canvas and your options for teaching with the new VLE. It also gives you access to your migrated modules from 17/18. Professional Services staff are also welcome to book a place on this workshop, although we are in contact with several School Administrators to arrange specific sessions for School Office staff.